Secretary-general of the PLO's Executive Committee urges international community to continue supporting UNRWA and the "refugees". 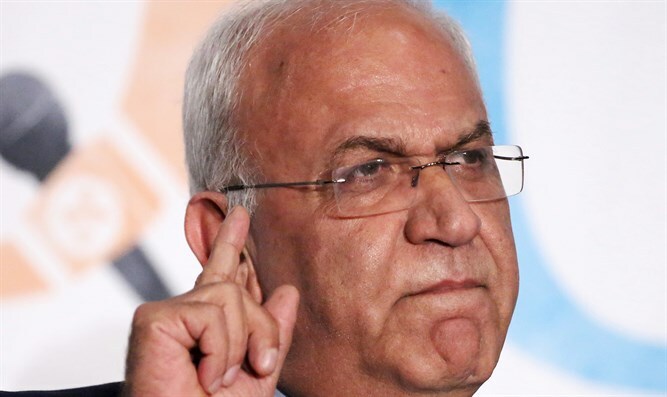 Saeb Erekat, the Secretary-General of the Palestine Liberation Organization’s (PLO) Executive Committee, on Thursday urged the UN to publish its blacklist of companies that do business in Judea, Samaria, the Golan Heights, and eastern Jerusalem. Erekat stressed the importance of publishing the blacklist of companies, institutions and personalities that help the "colonialist settlement." He demanded that the international community, especially the U.S. administration, declare that “settlements” are illegal and destroying the two-state option. Erekat’s remarks came during a meeting with diplomatic representatives, including the Russian ambassador, the French consul-general and the American consul-general. The UN Human Rights Council voted to approve the database of companies last year, despite objections from the United States and Israel. The Trump administration has been trying to persuade the UN not to publish the list. Recent reports said that U.S. Ambassador to the UN Nikki Haley conveyed messages through diplomatic channels to senior UN officials to the effect that the U.S. will cut all funding to the UN Human Rights Council if the blacklist is published. In his remarks on Thursday, Erekat also called on the international community to protect the United Nations Relief and Works Agency for Palestine Refugees in the Near East (UNRWA) and to provide it with the necessary assistance so that it can continue to provide services to “refugees”. In this context, Erekat mentioned the remarks made by the UNRWA commissioner, who warned of the organization’s financial crisis at a recent meeting of Arab foreign ministers in Cairo and claimed that the organization would not be able to function as soon as the end of this month if it does not receive international aid.